We all been there, after an release is moved to production, we move from one release to another for new development, so you need to get new copy of source code to work in our current development. But we have changes that are available in the OLD RELEASE BRANCH, that is needed for new development, it is very painful to copy source files, one by one by comparing the folders and their files. 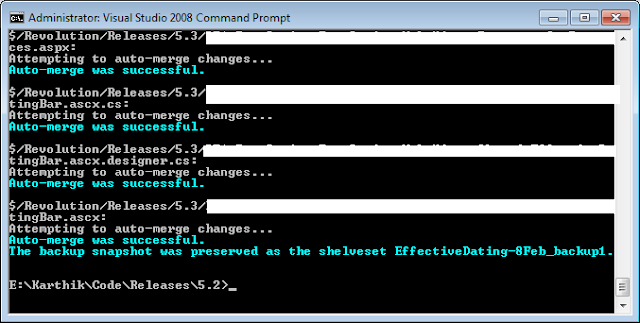 Best way is to SHELVE the changes to old release folder and then UNSHELVE in the current release folder. But this cannot be done in single right click. tfpt unshelve "<shelveset name>";<developername> /migrate /source:"<source branch solution path>" /target:"<target branch solution path>"
5. If there are any error message, then it may be usually because of any pending changes. tfpt unshelve "XXXX-8Feb";karthikeyank /migrate /source:"$/YYYY/Releases/5.3/DR1" /target:"$/YYYY/Releases/5.3/DR2/"
Make sure you install TFS power tools as per your TFS. Please make sure you navigate to the corresponding common folder path and run the command. Otherwise you might get "workspace not found error"
If you get a workspace not found error, run the below command, which will renew the cache.